The modern day Partridge family? Kim Kardashian and fiance Kanye West are so in-sync these days that they are even dressing alike. The reality mogul posted an adorable photo of three pairs of red sneakers — one for her rapper fiance, one for her, and one for their 8-month-old daughter North West – on Instagram. "#Famleezys!!!" she captioned the precious pic. Kardashian recently flew from her Los Angeles home to the East Coast with her young daughter to spend Valentine&apos;s Day with her main squeeze. She was surprised by 1000 red roses on the holiday of love, which she happily posed with and shared with her millions of fans. And though she&apos;s clearly proud of her family unit, Kardashian is not the first to share a photo of her family&apos;s kicks. 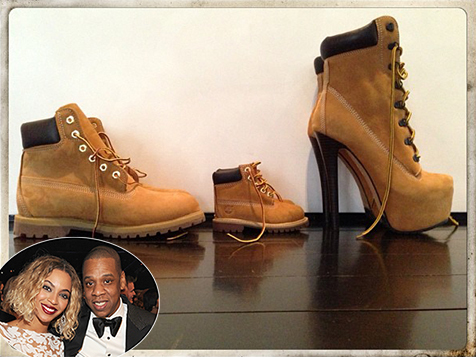 In July 2013, Beyonce Instagrammed a photo of her own family&apos;s adorable matching Timberland shoes, from now-2-year-old daughter Blue Ivy&apos;s tiny pair, to hubby Jay Z&apos;s classic style, to her own sky-high Timberland heels. Their matching shoe pictures aren&apos;t the only think the two power families have in common. Kardashian&apos;s rapper love just released an explicit remix version of Beyonce and Jay Z&apos;s hit single "Drunk In Love" on Feb. 15.